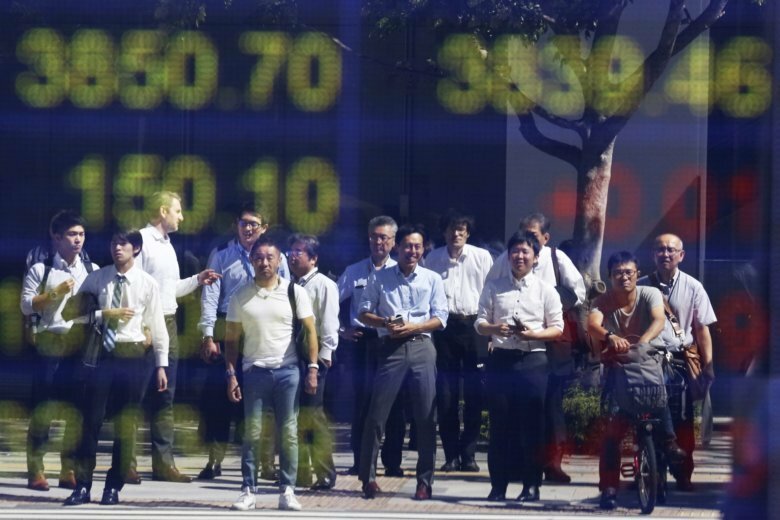 TOKYO (AP) — Asian stocks were mixed Monday after U.S. markets wrapped up their best quarter in almost five years, but sentiment was clouded by lingering worries over global trade tensions. KEEPING SCORE: Japan’s benchmark Nikkei 225 added 0.6 percent in morning trading to 24,277.51. Australia’s S&P/ASX 200 lost nearly 0.6 percent to 6,169.00. South Korea’s Kospi edged less than 0.1 percent lower to 2,340.25. Markets in Hong Kong and the Chinese mainland were closed for National Day holidays. TANKAN: A key quarterly economic survey by the Bank of Japan showed that sentiment among large manufacturers dipped two points to 19, as worries grow about global trade tensions. The “tankan” survey, released Monday, marked the third straight quarter of decline. THE QUOTE: “The shockwaves from the U.S.-China tariff exchange are now starting to appear in the data,” said Chan Wed Liang at Mizuho Bank in Singapore, adding the damage would likely worsen in October. CHINA DATA: Recent data from China show its exports shrank in September as a tariff battle with Washington over technology escalated, adding to downward pressure on the world’s No. 2 economy. Signs are emerging that Chinese trade, which had held up despite U.S. President Donald Trump’s tariff hikes, might be weakening. WALL STREET: The S&P 500 index was flat at 2,913.98. The Dow Jones Industrial Average rose 0.1 percent to 26,458.31. The Nasdaq composite added less than 0.1 percent, to 8,046.35. The Russell 2000 index of smaller-company stocks gained 0.4 percent to 1,696.57. ENERGY: Benchmark U.S. crude jumped 34 cents to $73.59. It rose 1.6 percent to $73.25 per barrel in New York on Friday. Brent crude, used to price international oils, added 48 cents to $83.21 per barrel in London. CURRENCIES: The dollar rose to 113.88 yen from 113.69 yen on Friday. The euro fell to $1.1597 from $1.1605.